From left: Jenelle Chu, Aaron Bartz, Ian Lassiter, and Ben Chase in “The Comedy of Errors” in Lenox. 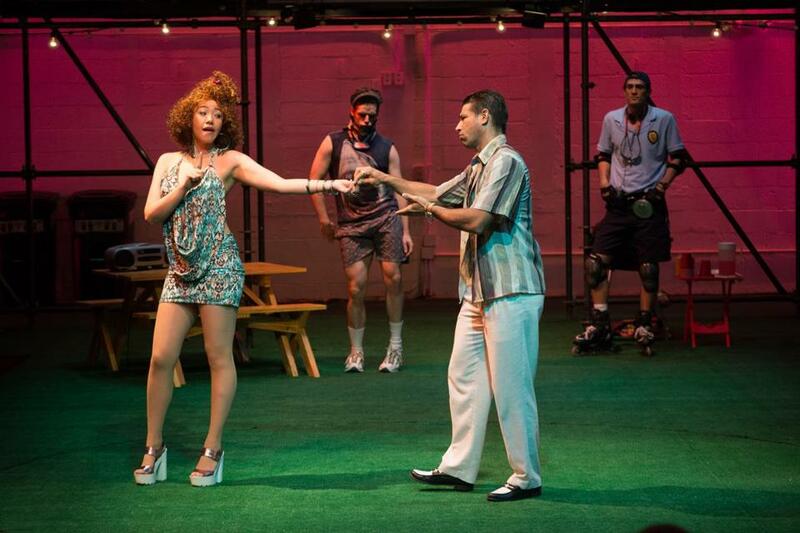 LENOX — A disco ball, New Yawk accents, and some really big hair add up to an enjoyably freewheeling production of “The Comedy of Errors,” running through Aug. 23 at the Tina Packer Playhouse. This production celebrates the elasticity of William Shakespeare’s structure, finding room for nods to “The Sopranos” and even “The Godfather” while almost always remembering to respect the text. Of course, “The Comedy of Errors,” whose plotline Shakespeare lifted from the Greek playwright Plautus’s “Menaechmi,” is built on an increasingly zany collection of slapstick and bawdy jokes. The basic plotline follows the search for two sets of twins separated at birth who conveniently share the same names: Antipholus of Syracuse and Antipholus of Ephesus. Likewise their servants, Dromio of Syracuse and Dromio of Ephesus. The action is sparked by the appearance of Egeon (Malcolm Ingram), the father of the Antipholus twins, who, while searching for his sons, has landed on enemy turf and is condemned to death by the Duke (Josh Aaron McCabe, so enamored of his Marlon-Brando-as-Don-Corleone impersonation his words are undecipherable). Little does Egeon know, but both of his sons are in Ephesus — one has been living there his entire life, along with his servant Dromio, while the other has just landed there by accident with his servant Dromio. What ensues is a series of miscommunications based on mistaken identities that result in some hilarious physical comedy and delightfully dizzying wordplay. For this production, both Antipholuses are played by Ian Lassiter, while both Dromios are played by Aaron Bartz, but each actor makes his characters distinctive. Lassiter is assured and a little arrogant as Antipholus, prominent citizen of Ephesus, while making his Antipholus of Syracuse a man with a bit of innocent charm. When Antipholus of Syracuse falls for Antipholus of Ephesus’s sister-in-law (Cloteal L. Horne), his approach is so sincere she is, understandably, both charmed and confused. As the Dromios, Bartz displays indefatigable energy with a series of pratfalls that would send most people to the ER. To his credit, he also manages to deliver Shakespeare’s verse clearly and confidently, and so he gets the biggest laughs from the Bard’s silly setups and witty turns of phrase. Kelley Curran, as Antipholus of Ephesus’s neglected wife, has a lot of fun with her sassy “Real Housewives of New Jersey” take on Adriana, but occasionally she lets her over-the-top performance overwhelm Adriana’s honest concern about the state of her marriage. Director Taibi Magar ups the party feel of the show with the inclusion of dance numbers by Whitney Houston and others, sung by cast members while the ensemble dances along. But she also has two cast members employ a remote control device to speed up or slow down scenes, a gag that distracts rather than contributes to the energy or the action. Magar’s emphasis on style means her cast sometimes runs roughshod over the text, but she redeems herself with a truly inspired final scene that pulls the audience right into the joke. This “Comedy of Errors” is a high-energy adventure that occasionally strays too far from the source, but boasts an ensemble that is having so much fun we forgive their errors. Sets, John McDermott. Costumes, Tilly Grimes. Lights, Matthew Miller. Sound, Stowe Nelson. Fight choreography, Michael F. Toomey. Choreography, Jesse Perez.